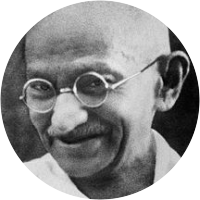 A collection of the best Mahatma Gandhi quotations. What you do may not seem important, but it is very important that you do it. No cost is too heavy for the preservation of one's honor. There could not be a cleansing without a clean confession. As the means, so the end. I am fighting for nothing less than world peace. An ounce of practice is more than tons of preaching. Perseverance opens up treasures which bring perennial joy. An eye for an eye will end up making the whole world blind. The world has enough for man's need but not for man's greed. Glory lies in the attempt to reach one's goal, not in reaching it. I must try to live in society and yet remain untouched by its pitfalls. The earth has enough for every man's need but not for every man's greed. The only tyrant I accept in this world is the still small voice within me. Indeed, I hold that what cannot be proved in practice cannot be sound in theory. The students' minds must not be caged, nor for that matter those of the teachers. We should cease to grow the moment we cease to discriminate between virtue and vice. If we develop the force of will, we shall find that we do not need the force of arms. The moment there is suspicion about a man's motives, everything he does becomes tainted. I am a practical dreamer. I want to convert my dreams into realities, as far as possible. A man cannot develop his mind by simply writing and reading or making speeches all day long. Nonviolence has come among people and it will live. It is the harbinger of the peace of the world. People are the roots, the state is the fruit. If the roots are sweet, the fruits are bound to be sweet. The golden rule is to test everything in the light of reason and experience, no matter from whom it comes. I think the political life must be an echo of private life and that there cannot be any divorce between the two. If the animals had intelligent speech at their command, they would state a case against man that would stagger humanity. To conquer the subtle passion seems to me to be harder far than the physical conquest of the world by the force of arms. True morality consists, not in following the beaten track, but in finding out the true path for ourselves and in fearlessly following it. He who perishes sword in hand is no doubt brave; but he who faces death without raising his little finger and without flinching is braver. Do not worry about what others are doing! Each of us should turn the searchlight inward and purify his or her own heart as much as possible. I have seen children successfully surmounting the effects of an evil inheritance. That is due to purity being an inherent attribute of the soul. God forbid that India should ever take to industrialism after the manner of the west ... keeping the world in chains. If [our nation] took to similar economic exploitation, it would strip the world bare like locusts.